So, the data is in, and for those of us who already LOVE dark chocolate, it is a boon. "The sweet stuff might lower our stress hormones." Might? Ok, I can attest, it does. 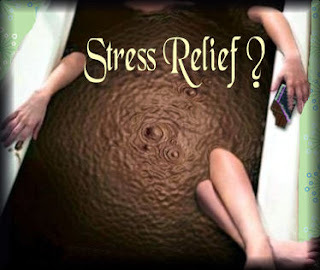 Those who actually eat a little bit (stressing the LITTLE in the bit part) of dark (again, note the DARK) chocolate every day for two weeks showed the most improvement in stress levels. As I have struggled with challenges, insecurities and darkness, I've learned one very important thing. Light and darkness can not exist in the same place at the same time. A very helpful mental tool that has done wonders for me, is the thought of a switch. I marvel at electricity. I don't understand it fully, but I respect it and know how much it infuses my day. 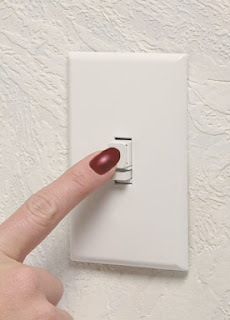 Thus it is not a far stretch for me to visualize in dazzling detail, the concept of a switch turning on, or off. . . something. When I have those pesky pessimistic thoughts, I can pause, mentally 'turn off the switch' and miraculously the thoughts fade away as if they were now literally 'in the dark'. I have also been able to 'turn on the switch' mentally of energy, a good habit, or more optimistic thoughts. "You look great in that. . . but. . . "
"I loved it, but. . . "
"Well, I thought it was successful, but. . ."
"I love you but. . . "
How do each of these make you feel? If you are like me, you cringe every time you hear that 'but'. Beware of the buts. They are the place where the previous positive (usually) comment gets diminished and often discarded entirely. Even when used in the reverse, the positive comment is weakened by the 'but'. "It could use some polishing, but. . ."
"If you worked harder you could improve, but. . . "
"I didn't like dinner much, but. . ."
While this makes for a better feeling, how about replacing the buts in your life with 'and'? This does the job of allowing the positive comment to remain on its own and refuse to be diminished by the next statement. "You look great in that. . . and. . . "
"I loved it, and. . . "